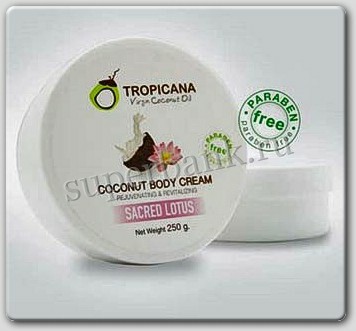 Intensive body cream enriched with coconut oil and lotus essences. The powerful antioxidants contained in cocoa butter, babassu and sweet almond oil improve skin condition from environmental damage. Your skin will be much butter: soft, smooth and glowing. This cream will prevent skin dehydration, especially helpful for dry rough skin on knees and elbows. Click the button below to add the Rejuvenating and Revitalizing Coconut Body Cream, "Tropicana" brand to your wish list.